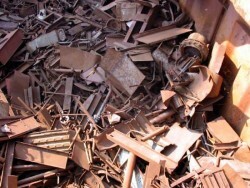 Scrap3A.com is a domain name used by Market Broker to promote Steel Scrap, Grade 3A, GOST 7204 for sale. Market Broker represents a trading arm of Our Metals, London based company. 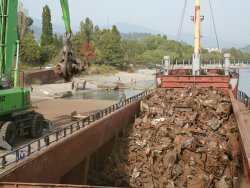 Deliveries of steel scrap are primarily made to Turkey and have been carried out since mid 90s. Please find our offer below and do not hesitate to contact us for further details. 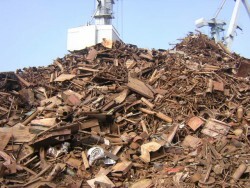 There is no limit to the volume of scrap that's available as such. The volume that we can sell per month depends solely on the number of ships that arrive to Sukhumi port that month. Please note, however, due to port restrictions, currently only 5,000 MT per month per client can be shipped. Bear in mind that the maximum volume of a ship would be 3,000 MT due to depth restrictions of Sukhumi port. The majority of river/sea ships that come in are 800-2000 MT. 20% of the cargo is possible to be composed by steel scrap pieces with thickness from 4-6 mm. The weight of a piece is no more than 600kg and not less than 1 kg. Scrap comes fully processed by press-scissors AKROS. FOB, CIF, CFR are accepted, can be delivered by one ship 3,000 MT or by a number of smaller ships 600-800 MT each. 95% paid by TT upon BL within 48 hours, 5% balance is paid after discharge at the port of destination. Irrevocable confirmed L/C resolving on sight in favour of first class bank. Certificate of product's origin is provided by Trade Commerce of Abkhazia in Russian language. Non-radiation and non-explosion certificates will be provided in English language by Abkhazian State Center of Ecology. Usually it is carried out at Turkish port, but can also be done at the Sukhumi port if necessary. You may also visit the scrap yard in Abkhazia. We agree on the price, volume and the date of shipment. The price is usually given 1-2 days before a ship arrives to Sukhumi port and is derived according to current market price. You will sign the contract with us and then with our scrap supplier. Find a vessel (we specify to the ship-owner the desired date of vessel delivery and the exact route). Provide details of the vessel to the buyer and agree on the vessel. It is possible to sign a long term contract for a certain quota. However, it is not possible to fix the price, since the price is determined 1-2 days before the shippment, based on the current market price. 22 April 2019 Copyright © Scrap3A.com; designed and developed by Web Diamond Ltd To the top!